Bali: an island of beautiful beaches, wellness retreats and rich cultural heritage. It’s also a mecca when it comes to girlie weekends away – especially Seminyak’s northern neighbour, Canggu – where the social and entertainment landscape is constantly changing. Here are some tips on the latest things to do, try and buy. To be treated like an A-lister, use a concierge service, like we did when ten of us decided to escape to Canggu for the weekend. Alicia Pasley-Tyler, who runs Latitude Lifestyle, seemed to know pretty much everything going on in Bali – where to stay, eat, drink, party, and she offered up a pretty impressive wine list too! She organised everything from our accommodation to our in-villa drinks on Friday night and our dinner on Saturday night, meaning we could just concentrate on having fun. Private cocktail bar and chef on arrival? Yes, please. What better way to be greeted at your villa on a Friday night than with your very own mixologist and chef on hand to cater to your every whim? We had already briefed our guys, via Alicia, that we wanted healthy food, and a couple of good vodka and white rum cocktail options. A bootcamp session lessens the guilt about any other weekend indulgence! We booked a Saturday morning bootcamp session through Alicia ahead of time. 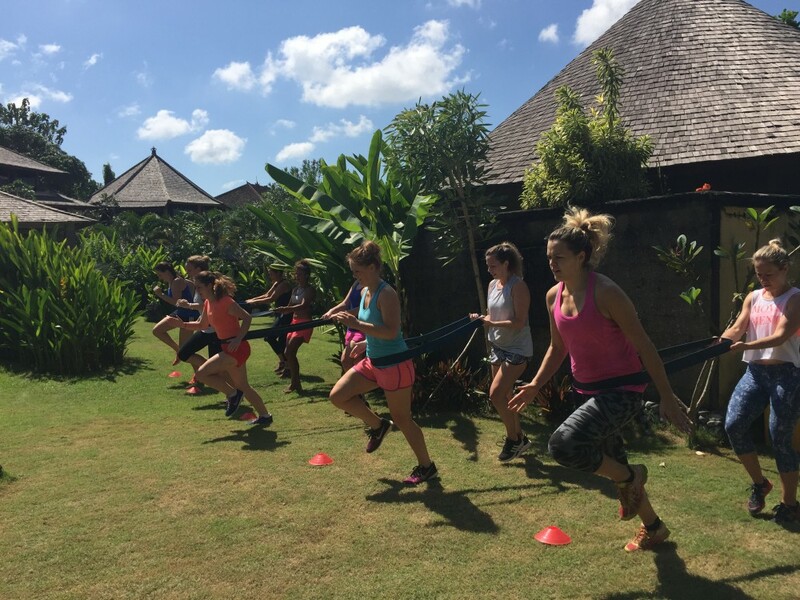 We were told that Clare, the bootcamp leader, could cater for all fitness abilities, but seeing as our party of ten were also part of the Singapore Gaelic Lions football club, we felt we could opt for a session erring on the tougher side. Clare turned up at 10am and pushed us through band sprints, kettle bell swings and all sorts of other fun and games, which meant we felt a lot better about the cocktail-fuelled day and night ahead of us. Inflatables make a villa or hotel pool just that little bit more fun, and a giant one can create a perfect Instagram moment with friends. Our huge unicorn and flamingo were delivered and inflated for us by Bali Floaties. If you’re interested in surfing, there are three places to surf in Canggu: Echo Beach, Berawa Beach and Batu Bolong Beach – then head to Old Man’s bar and restaurant for some post-surf sustenance. If you’re not keen on riding the waves, but want to get out of the villa for the day, you can jump around at Bounce Bali (bouncebali.com), the indoor trampoline park in Canggu. It’s perfect for a rainy day, and if you’re not keen on bouncing there’s always the bowling alley, or, if the sun is shining, Splash waterpark on the other side of the road. Whether you forgot to pack your favourite dress, or you’re simply in the market for some shopping, Canggu has plenty of cool retail outlets stocking more than just surfer chic. Two examples are Milk The Goat (milkthegoat.com/bali-shop) selling jumpsuits, onesies and tons of swimwear, and multi-label boutique The Offering (theofferingcanggu.com), both worth a window-shop at the very least. It wouldn’t be a break without some delicious food and drinks. Whether you’re looking for a relaxed brunch or lunch spot, or somewhere for a restorative Bloody Mary or two, Canggu has lots on the menu – from the relatively new Finn’s Beach Club along Berawa Beach, to the established La Laguna restaurant, which just so happened to be about five metres from our villa! The latter’s gypsy-themed décor includes funky caravans lining the entrance, violins, accordions and farming tools decorating the walls, and the menu follows a Mediterranean to Middle Eastern theme. Then there’s the health-driven Savage Kitchen, which uses regionally sourced and locally grown ingredients. Its menu caters to all kinds of dietary restrictions, from Paleo and gluten-free, to raw and vegan (thesavagekitchen.com). Old Canggu stalwart Beetelnut Café is still popular, particularly for breakfast items such as the naga bowl, Bali’s version of an acai bowl – but don’t overlook its great lunch and dinner menus. If you’re flying to Denpasar after work on a Friday, book your seats at the front of the plane to get ahead of the bun fight at immigration. Don’t forget to find out about your visa requirements. Visitors from the UK were exempt at the time of our visit, but things change. Don’t get caught out! 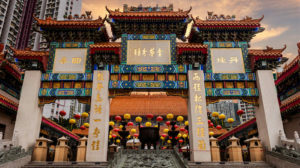 Bring spirits with you from Hong Kong if you want to enjoy a few drinks in your villa or apartment – it’s cheaper on the Changi side than in Denpasar airport. Take care of your belongings. Unfortunately, one of our group had her phone stolen from her handbag on the Saturday night of our trip; don’t leave bags unattended or open. Latitude Lifestyle can help with your holiday, organise bespoke events, act as a property agent, and help settle expats on the island. For more information about its services, call Alicia on +62 822 474 14552, or go to latitude-lifestyle.com. This article first appeared in the Feb/Mar edition of Expat Living. Subscribe now so you never miss an issue! Looking for more travel inspiration? Head to our Travel section for more great destinations.